Now you stand before the throne of the Lord. Our Holy Father Joseph, born in Constantinople to pious parents named Photinos and Theoktiste, was the brother of Saint Theodore the Studite (Nov. 11), and together they pursued a life of asceticism under the guidance of their uncle Saint Platon (Apr. 5) in the Monastery of Saint John the Theologian at Sakkudion of Bithynia. He and his brother opposed the unlawful marriage of the emperor Constantine VI (780-797) to their first cousin Theodote, known as the Moechian Controversy. The emperor divorced his wife Maria of Amnia, who had failed to provide him with a male heir, and married his mistress Theodote, an unpopular and canonically illegal act. Although the Patriarch Tarasios did not publicly speak against it, he did refuse to officiate the marriage. Popular disapproval was expressed by Theodote's uncle, Platon of Sakkoudion, who even broke communion with Tarasios for his passive stance. Platon's intransigence led to his own imprisonment, while his monastic supporters were persecuted and exiled to Thessaloniki from 795 to 798. After this they went to Constantinople and settled at the Studion Monastery. 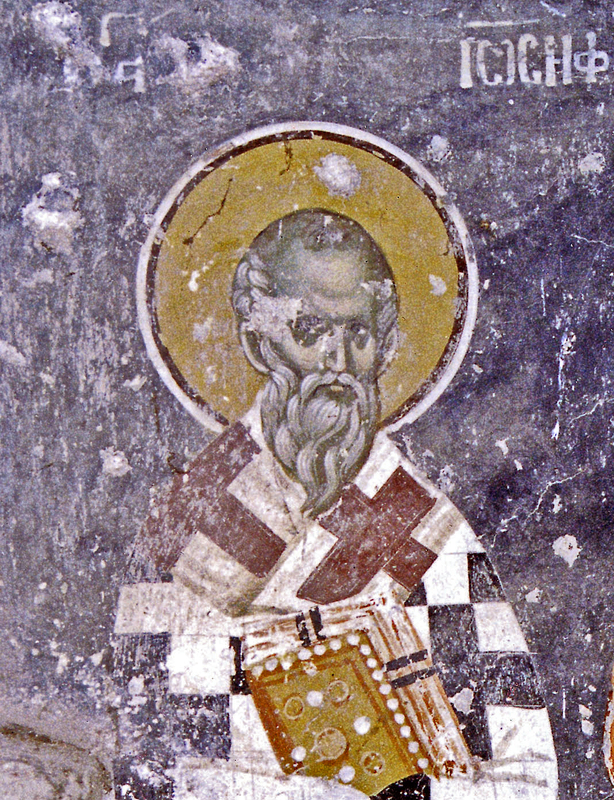 Because of his virtuous life, Joseph was unanimously chosen Archbishop of the city of Thessaloniki in 807. In 809 Joseph was tortured then banished to a barren island for his opposition to the elevation of Nikephoros from that of a layman to a Patriarch. This was decided by a synod of the time. The emperor Michael Rangabe (811-813) freed Archbishop Joseph from imprisonment. Under the emperor Leo V the Armenian (813-820) the holy hierarch and his brother Saint Theodore suffered once more for their veneration of holy icons. Though they subjected him to torture, he remained steadfast in his faith. The iconoclast emperor ordered him to sign the iconoclast confession of faith, and when he refused they threw him into an even more foul prison. Under the emperor Michael the Stammerer (820-829), Joseph was set free, together with other monks who had suffered for their veneration of icons. He spent his final years at the Studion Monastery, where he died on July 15, 832. In 844, under Patriarch Methodios, the relics of his brother Theodore were returned to Studion Monastery. Saint Joseph is renowned as a hymnographer, and is often confused with Saint Joseph the Hymnographer who reposed in 866. He composed triodia for Holy Week, several stichera of the Triodion, a Canon for the Sunday of Prodigal Son (which is filled with a spirit of profound repentance), and other hymns. He wrote several sermons for feast days, of which the best known is the "Homily on the Exaltation of the Honorable and Life-Giving Cross of the Lord". Having become a living icon, of the sacred virtues, the honor of the immaculate icon, of the Life-Giver Christ, you proclaimed, wherefore by your confession Joseph, you were eminently exalted, as the shepherd of Thessaloniki, and the Master of all glorified you.